A few simple add-ons is all it takes to make working at the router table faster and safer. or working with larger pieces. A T-track set in grooves in the face of each fence allows you to attach and position additional accessories like a featherboard, bit guard, and stop block. To build the fence, begin by cutting two pieces of plywood to a length that equals the width of your router table. You'll need to cut the piece for the tall fence a little wider. Next, center a notch at the edge of both pieces. This will provide clearance for the router bit. Then you can cut a long groove in the face of each piece and install the T-track in the groove. To provide support for both fences, I cut four blocks and then used glue and screws to attach them behind the fence. Finally, I added a small rabbet along the bottom edge of the fence. The rabbet provides a place for sawdust to prevent it from interferring with the cut. A router table can improve the capability of your router. But for your table to become a precision tool, you'll need to add a few important accessories. FENCE. The first thing you'll want to add is a fence. 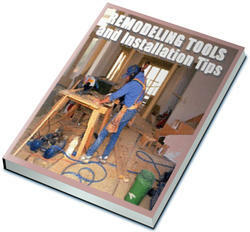 It's essential for you to be able to work accurately and safely at the router table. TALL FENCE. Much of the time, the height of the router table fence isn't a concern. 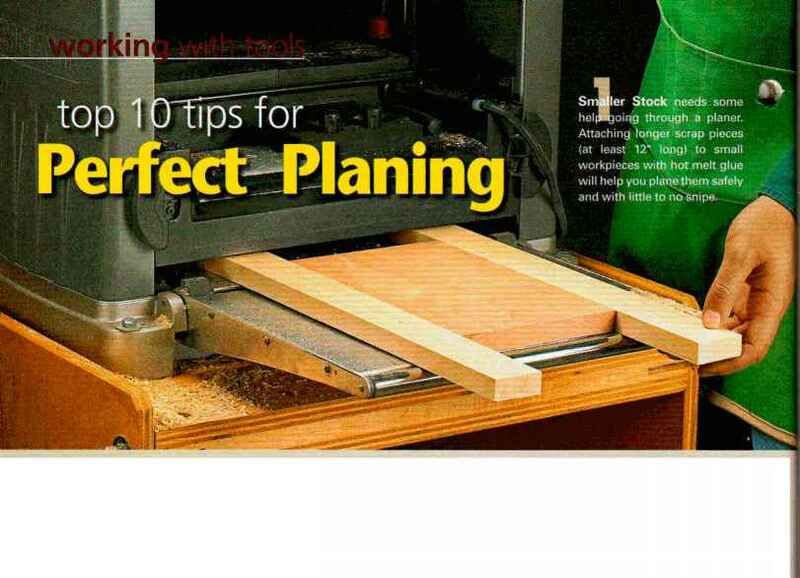 But whenever you need to work at the end of a long work-piece, cut splined miters, or rout a large panel, a tall fence like you see at left is a must-have to safely and accurately complete the task. As I mentioned before, the fence I built has a dual function. So it only takes a few seconds to make the switch to the tall fence. 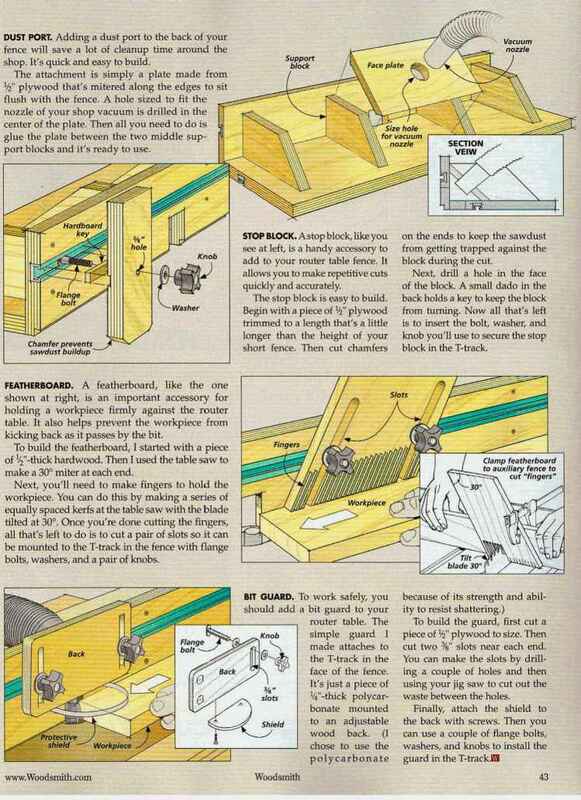 Just unclamp the fence, rotate it so the tall fence side is upright, and then secure it back in position on the router table. You can build a number of accessories, including a dust port, that can be used equally well with either the short or tall fence. And since you added a T-track to the face of the fence, all you need to do is slip flange bolts into the T-track, position the accessory, then tighten it down with a knob and you're ready to work. DUST PORT. Adding a dust port to the back of your fence wiil save a lot of cleanup time around the shop. It's quick and easy to build. The attachment is simply a plate made from V;" plywood that's mitered along the edges to sit flush with the fence. A hole sized to fit the nozzle of your shop vacuum is drilled in the center of the plate. Then all you need to do is L glue the plate between the two middle sup- fl port blocks and it's ready to use. STOP BLOCK. Astop block, like you see at left, is a handy accessory to add to your router table fence. It allows you to make repetitive cuts quickly and accurately. Next, drill a hole in the face of the block. A small dado in the back holds a key to keep the block from turning. Now all that's left is to insert the bolt, washer, and knob you'll use to secure the stop block in the T-track. FEATHERBOARD. A featherboard, like the one shown at right, is an important accessory for holding a workpiece firmly against the router table. It also helps prevent the workpiece from kicking back as it passes by the bit. To build the featherboard, I started with a piece of V2"-thick hardwood. Then I used the table saw to make a 30° miter at each end. Next, you'll need to make fingers to hold the workpiece. 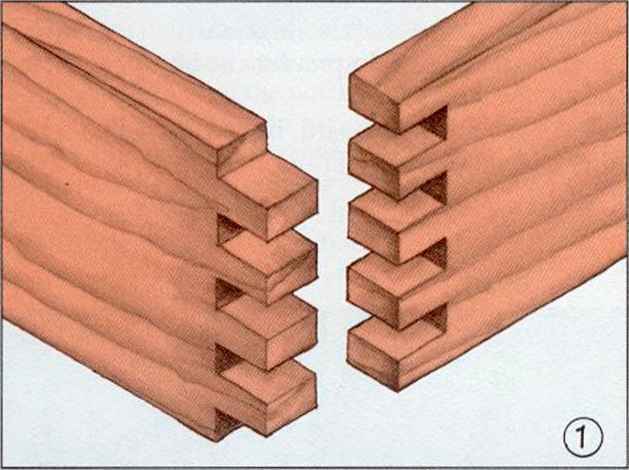 You can do this by making a series of equally spaced kerfs at the table saw with the blade tilted at 30°. Once you're done cutting the fingers, all that's left to do is to cut a pair of slots so it can be mounted to the T-track in the fence with flange bolts, washers, and a pair of knobs. Clamp featherboard to auxiliary fence to r^fv cut "fingers"
To build the guard, first cut a piece of V plywood to size. Then cut two %" slots near each end. You can make the slots by drilling a couple of holes and then using your jig saw to cut out the waste between the holes. Smgler Stock needs some hel[*)oing through 3 piarier. Attaching longer scrap pieces (at least 12" long) to small workpieces with hot melt glue will help you plane them safeiy and with littie to no'snipe.